The United States Air Force has at times in its history been at the forefront of Combatives Training. Soon after the establishment of the Air Force as a separate service in September of 1947, GEN Curtis Lemay was appointed as the Commanding General of the Strategic Air Command (SAC). GEN Lemay, who had masterminded the US air attacks on the Japanese mainland during World War II, knew that more US bomber groups in Europe had suffered more combat casualties than the US Marine Corps had in the pacific. In 1951 GEN Lemay appointed Emilio “Mel” Bruno, his Judo teacher and a former national American Athletic Union (AAU) Wrestling champion and fifth degree black belt in Judo, to direct a command wide Judo and combative measures program. From 1959 to 1966 the Air Force Combative Measures (Judo) Instructors Course was taught at Stead Air Force Base in Reno Nevada. The 155 hour course consisted of: 36 hours fundamentals of Judo, 12 hours Aikido, 12 hours Karate, 12 hours Air Police Techniques, 12 hours Aircrew self-defense, 18 hours Judo tournament procedures, 5 hours code of conduct and 48 hours training methods. There were also a 20 hour Combative methods course and a 12 hour Combative survival course for Aircrew members. With the Wars in Iraq and Afghanistan the demand for Airmen with the ground troops on the battlefield grew significantly over their historic role. In response Commanders around the Air Force started independent training programs to both teach hand-to-hand combat and instill a warrior ethos in deploying Airmen. Because of the decentralized nature of the training, approaches varied wildly. In 2007 the Chief of Staff of the Air Force ordered a review of all hand-to-hand combat in the Air Force. He tasked the Air Education and Training Command (AETC) to form a study committee to plan a way forward. The result of all of this was the Air Force deciding to adopt a program based upon the Army Combatives Program but modified to fit the needs and culture of the Air Force. 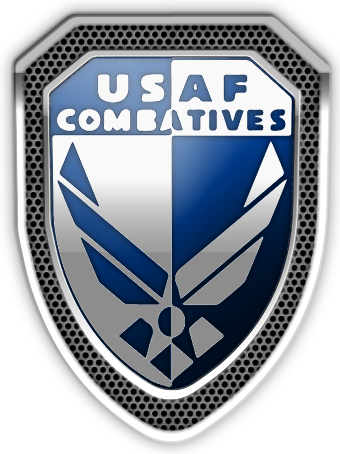 In 2009 USAFA was appointed the Center of Excellence for Air Force Combatives. Currently, USAFA, OTS, ROTC, BMT and AFSCs including Para Rescue/CRO, TAC-P and Security Forces are in the process of implementing the Air Force Combatives Program. Coach Durnil is the Chief of Training and Instruction at the Air Force Combatives Center of Excellence (AFCCOE). He is responsible for developing the implementation of the Air Force Combatives Program (AFCP) which trains 30,000 Airman annually in accession level and tech school training including TACP, ParaRescue, and Security Forces. As Area Coordinator of Combatives at the United States Air Force Academy Coach Durnil directs a teaching cadre that trains 2,000 students annually for college credit. He is responsible for program development, safety within the athletic department, and joint training with 4th Infantry Division and 10th Special Forces Group (Airborne). Before joining USAFA, Coach Durnil worked as Senior Instructor at Kansas States University’s Modern Combatives Program. He supervised the creation of Modern Combatives Education classes that targeted soldiers, ROTC cadets, and student athletes. In addition he developed additional supplemental resources for nutrition, risk analysis, and methodology. Coach Durnil is a black belt in Brazilian Jiu-Jitsu under Daniel “Montanha” De Lima.